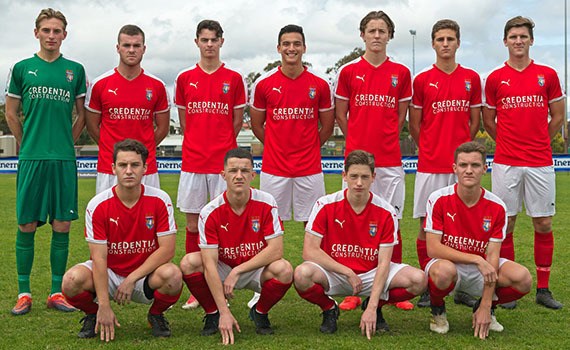 ECU Joondalup under 20’s has been beaten 4-2 on penalties by Perth Soccer Club in the McInerney Ford Top Four Cup Final, after the game ended 1-1 after 90 minutes at Frank Drago Reserve. Louis Rossi gave Perth the lead on 20 minutes, but ECU levelled when the unfortunate George Festa turned the ball into his own net. But in the shoot-out Perth were unstoppable and converting all four of their penalties to win it. “It just wasn’t our day, we had a nervous first half performance and conceded a poor goal from a follow up from a free kick, and at half time we refocused and came out more like ourselves,” ECU Coach Mark Scanlan said. The Jacks had beaten Perth SC 4-0 in their semi-final last week, found themselves behind on 20 minutes, with Rossi firing home. ECU hit back and created several chances, the best went to Jack Carroll, whose half volley flashed over the top. ECU were on the front foot after half time, but couldn’t break a tight Perth defence, but on 70 minutes they did find the equaliser. Liam Fyfe’s ball into the box was turned into his own by Festa. It was ECU on top now and they went close to winning it seven minutes from time, Liam Murray cut in from the left and his curling shot hit the post and away to safety. Both sides pressed late but couldn’t the winner, and it was off to penalties. Perth custodian Luc was the hero for his side in the penalty shoot-out, making two excellent stops to deny Ronald Rixer and Ben Hinshelwood. Keeper Malek Luc who saved two penalties in the shoot-out, said it was a great win. “I think it’s a great win for the lads and I to get some gold around our neck, with the difficult times we have had with things changing around us and having to cope with that all while playing, so at the end we finished as winners, huge congratulations to the boys on that,” he explained. “I think ECU has been strong throughout all their season and brought a challenging game to us. But as a team we all stuck together and played with a bit of character, we were fortunate with our goal and then unfortunate with the goal we conceded being an own goal.